Male birds-of-paradise are infamous for their wildly extravagant feather ornaments, complex calls, and shape-shifting dance moves, which have all evolved to attract a mate. New research published in the open-access journal PLOS Biology suggests for the first time that female preferences drive the evolution of combinations of physical and behavioural traits that may also be tied to where the male does his courting: on the ground or up in the trees. Lead author Russell Ligon, a post-doctoral researcher at the Cornell Lab of Ornithology, suggests that females evaluate not only how attractive the male is, but also how well he sings and dances. Female preferences for certain combinations of traits result in what the researchers call a "courtship phenotype" – bundled traits determined by both genetics and environment. 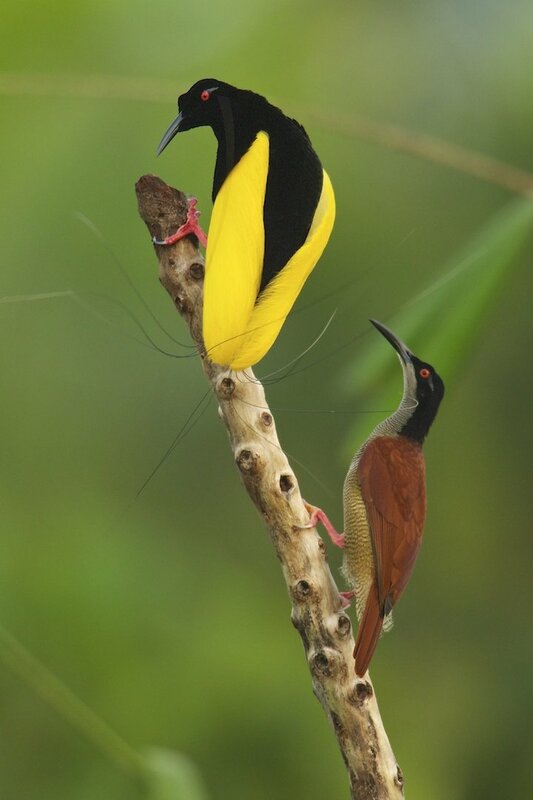 A female Twelve-wired Bird-of-paradise inspects a male during courtship (Timothy G Laman). As the number of colours on a male increase, so do the number of different sounds he makes. Males that display in a group (called a lek) have more colours to stand out better visually against their competition. Because female birds-of-paradise judge male quality based on a combination of characteristics, the study suggests that males may be able to evolve new features while still maintaining their overall attractiveness to females – there's room to 'experiment' in this unique ecological niche where there are few predators to quash exuberant courtship displays. The researchers found that where a bird-of-paradise puts on his courtship display also makes a difference. Edwin Scholes, study co-author and leader of the Cornell Lab's Bird-of-Paradise Project, explained: "Species that display on the ground have more dance moves than those displaying in the treetops or the forest understory. "On the dark forest floor, males may need to up their game to get female attention. Above the canopy, where there is less interference from trees and shrubs, the researchers found that males sang more complex notes, where they are more likely to be heard. But their dances were less elaborate – perhaps a nod to the risks of cutting footloose on a wobbly branch." Ligon, R A, Diaz, C D, Morano, J L, Troscianko, J, Stevens, M, Moskeland, A, et al. 2018. Evolution of correlated complexity in the radically different courtship signals of birds-of-paradise. PLoS Biol 16(11): e2006962. doi.org/10.1371/journal.pbio.2006962.